50. Isabella Little. Daughter of David Little & Margaret Ann Herbert (link to Herbert family pages). Born 20 Jun 1845 in Harvey. Christen 27 Jul 1845 in Harvey By Rev. Daniel McCurdy. Died 18 Mar 1905 in Harvey. She married James Embleton (link to Embleton family pages), son of William Embleton (link to Embleton family pages) & Jane Runchman (link to Embleton family pages), 4 Apr 1866 in Harvey, York Co., NB By Rev. Samuel Johnson. Born 5 Apr 1836 in England. Died 23 Oct 1901 in Harvey. Buried in Harvey Settlement Cemetery. Occupation Farmer. 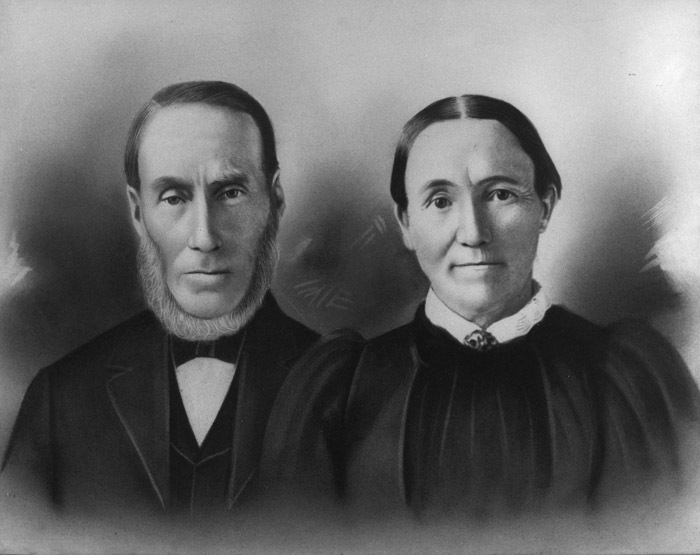 Witnesses to marriage of James Embleton and Isabella Little were Joseph Embleton and Jane Little. Large format crayon photographic portrait of James Embleton (b. 5 Apr 1836, England, d. 23 Oct 1901, Harvey) and second wife Isabella Little (b. 20 Jun 1845, Harvey, d. 18 Mar 1905, Harvey). Source: Linda Harris, Feb. 2007. Large format crayon portrait of five female generations of Isabel Embleton and her descendants taken ca. 1889 based on apparent age of infant Isabel Robison. Those in the photo, descending down the family tree, are: (Far right) Isabella Embleton (b. 9 Jun, 1804 (Haugh Head near Wooler) - 16 Feb 1892 Harvey Station, wife of Thomas Herbert; (third from right) Margaret Ann Herbert (b. 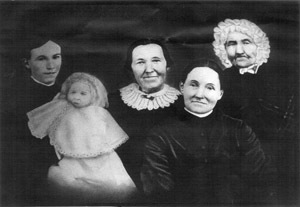 19 Jul 1825 - d. 10 Jan 1913), wife of David Little; (second from right) Isabel Little (b. 20 Jun 1845 - d. 18 Mar 1905), wife of James Embleton; (Far left) Margaret "Maggie" Embleton (b. 19 Jan 1867 - d. 25 Jul 1952), wife of George Robison; (Infant) Isabel Robison (b. 9 Jan. 1888 - d. 18 Dec 1918 of Spanish Flu). James first marriage was to Mary Lister (link to Lister family pages). (PANB #F15552, p. 432: James Embleton and Mary Lister on Apr 15, 1861 by Samuel Johnson, witnesses Margaret J. Embleton and Edward Lister.) After Mary's death (on 6 Jun 1861), Jim married Isabell Little. He lived on the farm known as the Tom Lister farm, near Frog Lake, and had five children from his second marriage. Complete information on this family begins on page 101 in the book, "The Little Family of Harvey Settlement 1786-1992" compiled by Janet Swan Watson, Brenda Saunders Swan and Jocelean Swan Hall.